With the advent and popularity of online merchants such as Steam, the Xbox Live Arcade, PlayStation Network, and the Nintendo eShop, it really isn’t all that hard to get your retro gaming on. It especially isn’t too difficult to get your hands on independent games based on classic titles. Fully funded by noble Kickstarters, ensuring quadrupled its development target, Shovel Knight is the latest in these new old-school style games based on classics, and it’s one of the best with improvements still coming. The game’s title really couldn’t be any more literal. 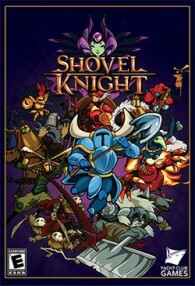 The game follows Shovel Knight on a quest to defeat the members of “The Order of No Quarter” who have been hypnotized by the Enchantress to keep him from saving Shield Knight, Shovel Knight’s esteemed partner. 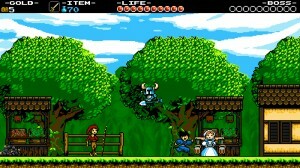 Shovel Knight is an 8-bit sidescrolling action game meant through and through to be an NES game. The game’s story hardly matters. It’s the game’s airtight gameplay and nostalgic look and sound that really make Shovel Knight a winner. This 8-bit action platformer acts as an ode to the NES, as it features a little bit of everything that really defined the console. 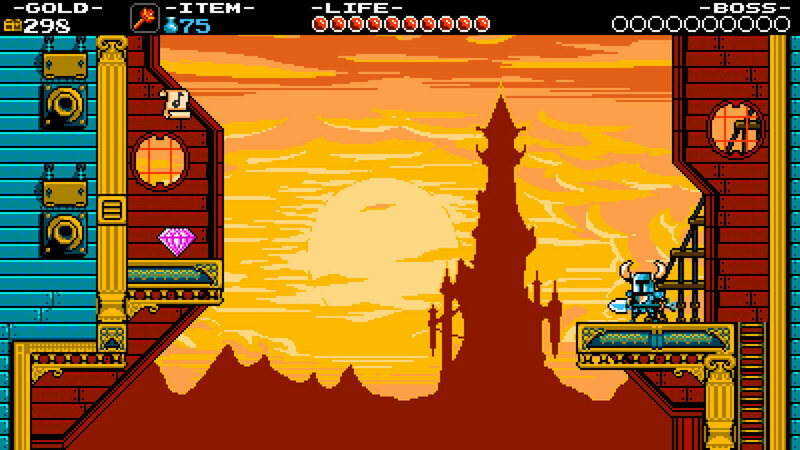 The game draws inspiration from such classics as Castlevania, Ninja Gaiden, Super Mario Bros. 3, DuckTales, Zelda II and the Mega Man games by taking a little bit of what made each game great to make Shovel Knight one of the best games of the year. The game actually starts off a little bit on the easy side, but at that, it doesn’t hold your hand either. Players shouldn’t expect a tutorial on the game’s controls because they’re pretty simple to begin with. All you do is walk, hit things with your shovel, jump, and bounce with your shovel DuckTales-style. This bouncing technique also works as a useful method to attack enemies while bouncing up to higher ground. Later levels in the game require players to get into the habit of jumping on enemies or obstacles with technique, allowing them to get to hard-to-reach areas. Taking a page out of Super Mario Bros. 3‘s book, this technique can also be used to jump offscreen, so players can get to places and find normally unobtainable items. As expected, the further players progress into the game, the more difficult it gets. While some of the later levels and bosses are definitely tough, they’re far from unfair. Most of my deaths were a result of me not actually giving my knight a fighting chance. It’s so easy to get caught up with the game’s level design and action that it’s also easy to forget that players have access to a town where they can spend their loot on upgrades and additional moves to make everything much easier. Of course, that shouldn’t stop anybody from seeing how far they can go without upgrading anything on their knight. 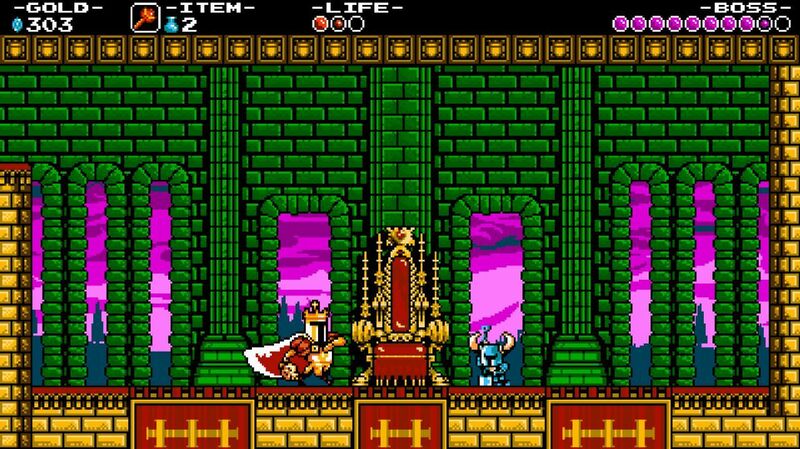 Anybody with any sort of appreciation for old-school and retro gaming owes it to themselves to give Shovel Knight a try. 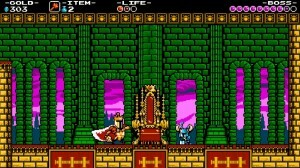 It has timeless visuals, a great soundtrack, the genius level design of Castlevania, combat close to the speed of Ninja Gaiden, platforming elements and a world map reminiscent to that of Super Mario Bros. 3, the pogo jumping of Scrooge McDuck in DuckTales, Zelda II‘s RPG element, and Mega Man‘s insistence that bosses can be both big and small. And despite the many features it’s borrowed from great games before it, the game also does a good job at giving itself its own identity. Yes, it’s a tad short at only about a four to five hour adventure, but Yacht Club Games has promised even more free DLC content in the form of levels, additional characters and quests, as well as powerups for players to use. $15 might seem steep, but there’s some awesome value to be had with Shovel Knight. The reviewer purchased the game through the Nintendo 3DS eShop and finished the game before beginning this review.